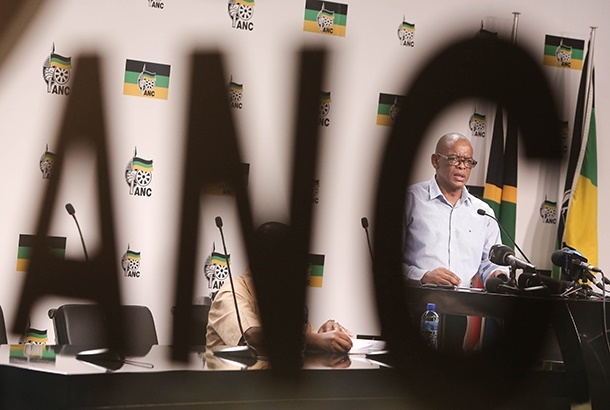 When under severe criticism or facing "attacking questions", to borrow a phrase, the ANC and its leaders tend to either hit back or recoil inside the seemingly solid shell of invincibility, asks Mpumelelo Mkhabela. The public debate sparked by the publication of the investigative book about the ANC secretary general Ace Magashule has so far missed an important point. In the Gangster State, Ace Magashule is depicted as an incorrigibly corrupt and selfish politician. Media reports on the allegations haven't done the justice to the important broader issues a book of this nature should necessarily trigger. Magashule's angry reaction (which is strangely the same as the official party stance), threatening legal action and boasting about electoral support, is also unhelpful. To add value to the debate we have to start with the undertaking the ANC, Magashule, party leaders and ordinary members have jointly made at elective conferences, the highest decision-making platforms. This is important because the media and other observers are often accused of imposing their moral framework on the ANC. When under severe criticism or facing "attacking questions", to borrow a phrase, the ANC and its leaders tend to either hit back or recoil inside the seemingly solid shell of invincibility. The consequence is that the ANC appears as sovereign from the very public whose support it needs to remain in power to fulfil its avowed historic mission to transform South Africa into a prosperous national democratic society. To avoid having the informed public and the ANC talking past each other on Magashule, state capture, party candidate lists, Jessie Duarte's anger management and other issues, let's rather hold the ANC to its own principles and undertakings. This shouldn't be difficult because the ANC publishes its documents. For the current purpose, we refer to only two Strategy and Tactics documents published ten years apart. For the uninitiated, the S&T, as is casually referred to in party circles, is an equivalent of an in-depth SWOT analysis conducted every five years, looking at the party's capacity and strategies on a range of issues. It's supposedly one of the most debated documents. In the past, ANC intellectuals used to spend a lot of time discussing and refining it until its ratification. Let's consider parts of the 2007 S&T. The year is important because that's when Magashule effectively secured his long-coveted position as the next premier of Free State by being part of the winning slate of Jacob Zuma. The S&T adopted in that year sought to position the ANC as the only party that should continue to lead and transform South Africa towards a full national democratic society. But to fulfil this duty, the ANC and its leaders would have to behave in particular ways. Members of the ANC must continuously improve their technical and political capacity so that they become the most advanced in society, the document said. "As such, the ANC cannot conduct itself as an ordinary electoral party. It cannot behave like a shapeless jelly-fish with a political form that is fashioned hither and thither by the multiple contradictory forces of sea-waves," the document said. "There should be clear value systems that attach to being a member and a leader of the ANC, informed by the strategic objectives that we pursue." In light of this undertaking, of which Magashule was part, and the party's reaction to the publication of Gangster State, we have to ask: is the ANC behaving like a jelly fish or is it firm on its value system? What is the value system? Is it clear to the society the ANC says it leads? The 2007 S&T further state: "In essence, the ANC is faced with two options: either to act as a party of the present, an electoral machine blinded by short-term interest, satisfied with current social reality and merely giving stewardship to its sustenance. Or it can become a party of the future, using political power and harnessing the organisational and intellectual resources of society ..."
In dismissing the book, Magashule, said the party won't be distracted in its pursuit of a landslide victory in the 2019 elections. He is probably right that the ANC will win the elections. But we have to ask: does this response confirm that the ANC has chosen the option of being an electoral machine at the expense of the other sensible considerations? What are the long-term consequences of this choice? Let's fast forward to the 2017 S&T - the latest. The year is important because it marked another leap, however contentious, for Magashule from being provincial chairman and premier to national secretary general. The document bemoans the extent to which the ANC was failing to deal with rampant selfish interests. Courts had to provide leadership. "Instead of being the centre of transformative and ethical rectitude, increasingly the ANC and the government it leads have occasionally to be directed from elsewhere – in the manner of 'lawfare' – to do right. The moral suasion that the ANC has wielded to lead society is waning; and the electorate is starting more effectively to assert its negative judgement." Does the legal threat against the book not cement exactly what the ANC and Magashule complained about in their own very key document? The 2017 version also suggests ways to deal with the problem. Among them are self-correction, an active integrity commission and choosing leaders of integrity in all structures. The ANC finds it difficult, if not impossible, to implement these undertakings. Self-correction is the most favoured option because repentance is the choice of the individual concerned who is not accountable to anyone for his lack of self-correction. The integrity commission is often subject to factional power brokers within the party. And the choosing of people of integrity is not backed by mechanisms to enforce it. If the S&T has any meaning to Magashule, he should be leading the ANC in its renewal efforts, urging the removal from high office people who undermine the party's strategies and tactics. But this would be like expecting Jomo Sono, the owner and coach of Jomo Cosmos Football Club, to self-correct or fire the underperforming coach. (With due respect to the football great, though).